As you probably know by now, I'm drawn to my subjects for their irony, isolation, beauty and especially their "story" or the history behind them. I enjoy learning more about my subjects. In fact, I often do research on my own, but interestingly, I often learn about my subjects from the viewers. One painting in particular, "Leading Shadows" has garnered the most input from others and I've proven it out myself. Since the original painting recently sold, and I also just sold a print of it this month - this image seems to be hot right now - so I thought it might be fun to share it's development and some of the stories people I've met have shared with me. Unfortunately, I neglected to snap a shot before I layered the first wash, so here it is with a warm wash - over the drawing. 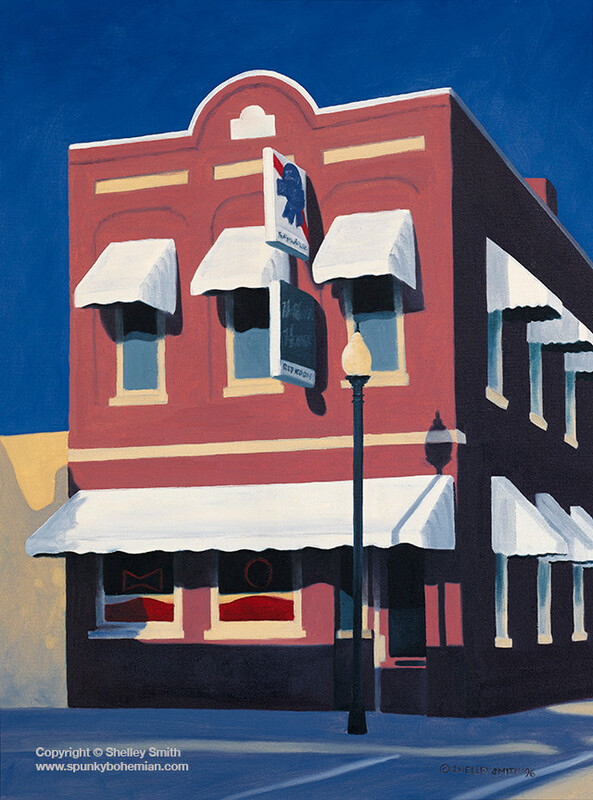 Back in 1996, when I was really young, I painted a little place called The Red Room - a mainstay tavern on 3rd Avenue in Sturgeon Bay, Wisconsin. This painting was always one of my favorites, and is featured in my notecard set. "The Red Room" - oil on canvas - 21" x 16"
Finding Beauty in a "Neighborhood Survivor"
Although I've been negligent in adding "Neighborhood Survivor" to my web store, I'm still going to share my creation process with you. 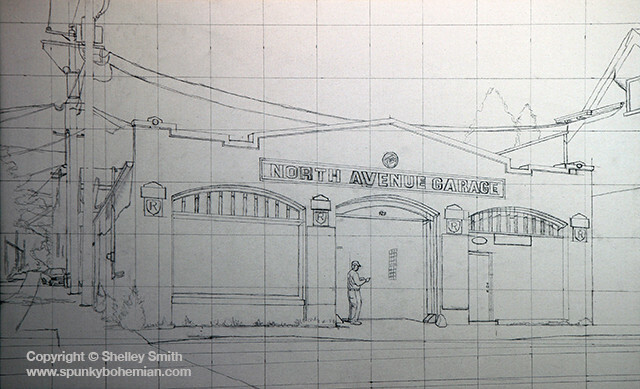 I love this little building - the North Avenue Garage. So it's fitting that the perspective in my painting makes the building appear much more significant, much larger, than it is in real life. 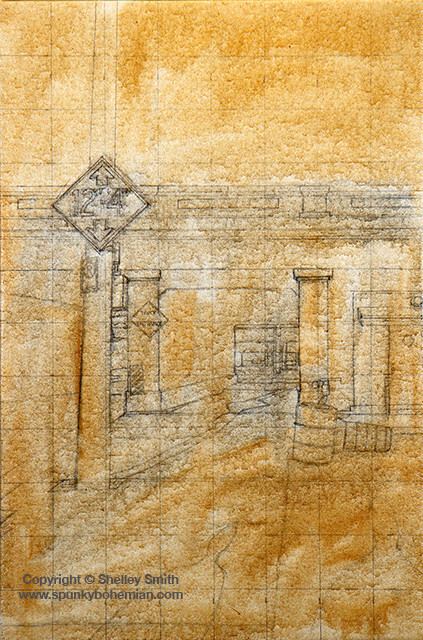 Here's how it began - as a pencil drawing on the canvas - using a grid to maintain proper perspective and proportion. To see how it's finished, keep reading. Playing, I Mean, Painting "The Harp"
Whenever I create a piece, it's painted in layers. Each painting has its own personality and process. Sometimes I paint the wash, the first layer, with similar colors to the finished product and sometimes I use the "opposite" or complementary colors for the underlayment. In the case of "The Harp," I mixed it up a bit. 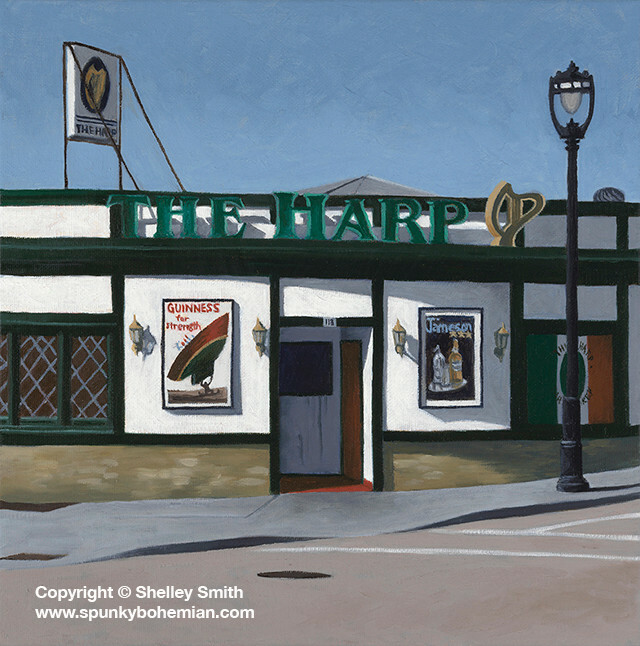 See how I brought this classic tavern, "The Harp," to life for the Milwaukee Art Museum's inaugural Artnonymous event.